XLRI today signed a Memorandum of Understanding( MoU) with Victoria University, one of Australia’s leading universities with 11 campuses in Melbourne an around 44,000 students. The MoU was signed by Father N Casimir Raj, Director XLRI and Prof. Bernadine VanGramberg, Head of the School of Management, Victoria University, Melbourne, Australia. Also present at the occasion were Prof. Julian VanGramberg, Director, School of Business, Monash University, Melbourne, Australia and senior faculty members of XLRI. Speaking on the occasion, Father Casimir Raj said that the MoU would be beneficial to both the schools and that they would work together in the exchange of information and material, in joint research and in joint service activity. 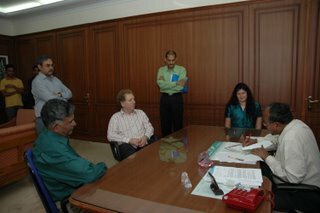 Another significant understanding was the exchange of both students and faculty. The exchange program for students would aid in providing the students an international exposure in today’s globalised world.